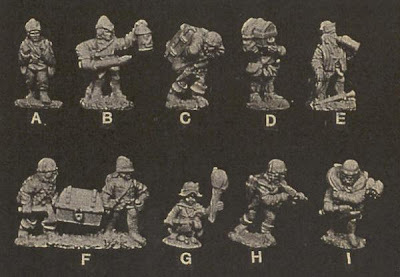 The very fact that Grenadier produced an entire boxed set filled with torch bearers, guys toting treasure chests, and even a "potion tester" (he's figure E in the image above) tells you far more about the way D&D was played back in the day than I ever could. Old school D&D was not a game in which a small band of hyper-competent heroes braved the dangers of the world with only their swords, spells, and wits to protect them. No, they had a veritable army of hirelings and henchmen to assist them and these guys all got a share of the loot in exchange for their assistance. Considering that the life expectancy of a hireling could be measured in minutes in some cases, those that survived the dungeon certainly earned their share. I have lots of fond memories of hirelings in my old adventures and campaigns. I had much fun roleplaying the lucky few who survived, some of whom even graduated to becoming full-fledged PCs when one of their betters became the victim of undiscovered trap or unavoidable death effect. Although the high mortality rate of hirelings could be played for laughs -- and sometimes was -- I often found it a useful way to emphasize the grimness of dungeon delving. Likewise, killing off a hireling was a good way for me to warn my players when they were behaving in a reckless or foolhardy fashion. They didn't always get the hint when their halfling scout never returned from venturing up ahead "into the source of that strange sound," but no one could ever claim I wasn't giving them a fair shake. The loss of hirelings as an integral part of the D&D experience is, I think, another example of how the game of today and the game published in 1974 really don't have a lot in common. I never got to use hirelings and henchmen very much in my early D&D games during the 1980s. The concept seemed to have been abandoned in 2e (I don't remember) and I had gone on to play GURPS during the 1990s. When I returned to D&D after 2000 and actually started playing again in 2005, I felt that they were sorely missed. Without hirelings, who is going to watch the camp outside the dungeon and help carry your loot? Without henchmen, how else does one start a fiefdom? I saw Robert Zemeckis' Beowulf last year. I pictured the hero as a high-level fighter with a large group of henchmen. And I lamented that such an arrangement was no longer a part of the rule mechanics of D&D. Any henchmen or hirelings were adjudicated by the DM and not based on Charisma scores or any concrete guidelines. Slightly apropos, Zelazny's Forever After collection has a story that is very hireling* heavy that you might enjoy. *Well, soldiers, but filling the same niche. I started with the Mentzer Basic set, and I remember it included a few pages on hirelings and henchmen, but I just ignored them. For some reason, and I'm not sure why, the idea of hirelings never appealed to me, in the same way that I ignored the section on pack animals and their carrying capacities. I guess marching into the dungeon leading a donkey didn't strike me as very heroic. Funnily enough, I've recently come around to the idea of hirelings and pack animals and such, thanks to my long-running Pendragon campaign. Having a train of squires, spare horses, and such is a basic conceit of the game. In much the same way as your hireling-turned-PC experiences, we've had squires get knighted and become full-fledged PCs as well. Maybe--and I'm sort of just now giving some thought-- the divide comes down to one's source of inspiration: cinema vs. literature. As a kid, most of my inspirations were movie-related. Conan the Schwartzenegger certainly didn't have any mules following him around! But if you look at literature (LotR, Le Morte d'Arthur, whatever), there are usually flunkies lurking in the periphery, and I have definitely read a lot more fantasy literature as an adult than I ever did as a kid. If you look at the OD&D rules and play by them as written, Charisma is the most important stat and hirelings play a huge role. Looking at early play reports from Arneson, Gygax, and Kuntz, they in fact used lots of these guys to save wear and tear on the PCs. Yet it's funny, with the kids I played with hirelings were an afterthought, Charisma was a dumpstat, and in general this part of the game easily languished. Maybe it's because of the extra GM bookkeeping? This is an interesting case of something that happens all the time with games (e.g. collaborative Jenga, people ignoring the auction rules in Monopoloy) - people didn't play according to the rules as written, they gravitated without incentive towards a single-protagonist game instead. I imagine that the reasons come out of the activity of roleplaying itself. On the one hand, a player running multiple characters can interfere with immersion, which a lot of people, including more than a few old schoolers, value. But if the GM has to run them, it creates a big bookkeeping hassle and even more bog-down for the players in combat. My PCs often have hirelings which they run in combat and I run out of combat, my best solution to the problem. But this issue isn't just an arbitrary drift of later authors, I don't think, it's something that grew regularly out of OD&D, Holmes, and AD&D play themselves, even though the rules gave incentives otherwise. I think if hirelings had been on the regular equipment list the history of this style of play might have been longer and stronger. Little things like that make a big difference. We never really played with hirelings either. I think part of the fault is that the game doesn't really describe the process of hiring them all that well. I wonder though if a bigger factor is that we didn't come to D&D through the evolution from Chainmail battles. Dave Arneson's first dungeon scenario was part of a wargame campaign. Of course for a wargame, you have rank and file troops and commanders. So as the individual character game developed, the players were still in mind to have rank and file (hirelings) and commanders (PCs). Those of us who came straight to D&D saw hirelings getting a share of the treasure and experience. It seemed like they would diminish the PCs. I mostly agree with what Frank said, and with sirlarkins's first paragraph. Furthermore, it seems to me good characters (And I have always preferred good characters) would not be so callous as to send innocent commoners down into so dangerous a place as the average dungeon. Perhaps a particularly devoted servant, or a pack animal, but as a general rule it just doesn't seem moral to me. I think I still have A, B, and G around here somewhere. I've even used B for a player character. The group I played with the longest averaged about four players (including the DM), so we frequently had to make use of henchmen and hirelings to fill out parties. I think it would be cool to have a just-for-gits-and-shiggles adventure in which the PCs are all hirelings (torchbearers, potion-testers, etc.) whose adventurer bosses have all been killed off, leaving them to have to fend for themselves as they fight their way back to civilization. Maybe--and I'm sort of just now giving some thought-- the divide comes down to one's source of inspiration: cinema vs. literature. I remain convinced that one of the biggest divides between old school D&D and its descendants is its sources of inspiration, so I wouldn't be surprised if it's at work here too. Mind you, I don't recall too many pulp fantasy characters employing an army of hirelings in their adventures. I think this is a case where OD&D's wargame roots are the culprit. If you look at the OD&D rules and play by them as written, Charisma is the most important stat and hirelings play a huge role. Charisma is the only stat in OD&D for which there are actually rules written to simulate. The other stats are mostly of use if they're the Prime Requisite for your class, but Charisma is valuable for every class. Ironically, my friends and I always looked on hirelings as evidence of just how powerful and influential our PCs were. If they could hire and command a small army, they must be people of importance. Hirelings aren't "innocent commoners," though; they're mercenaries who signed on to a dungeon expedition knowing the risks and hoping to get a share of the treasure (and XP). They're basically NPC adventurers. Most people look at Charisma as a dump stat, but I find Charisma to be important trait in any hero, moreover, a great leader. I see henchmen as being akin to the nameless extras from a Harryhusen movie (or Red-shirts from the old Star Trek show). They supplement the man-power during a fight, help haul out the treasure, and when the DM needs to express the dangers of the adventure, they are scarified to the plot like lambs to the slaughter! I really enjoy henchmen, and me and other player I know tend to become really attached to some of them. Unfortunately, wizards don't think the same way. They think of henchmen as unheroic and are only used to be abused. In the 3.x books, the rules feel like they browbeat you for using them. And 4e outright abolish them! They see it as something to "steal the thunder form the PC's heroics", but the truth is, when player start taking the help for granted, is the time the players find themselves having to push their own sled. I tend to use henchmen that goes beyond Men-at-arms, I like to include cooks, guides, camp-followers, teamsters and such. Most of them are left behind when exploring ruins or a dungeon. I see henchmen as the sort of people who are drawn to adventure to escape their mediocre lives, and to live well off the wealth that comes from exploring such dangerous places (even if they would just piss it all in a week!). marching into the dungeon leading a donkey didn't strike me as very heroic. Now I so want to do a Yukon 1850s game, where over-ambitious gold prospecting opens a path into ancient tunnels. I'd even disallow guns using the simple expedient that all the powder got wet in a series of heavy rainstorms, and you don't want to wait for dry powder because delaying runs the risk of having your discovery become public. The PCs have axes, picks and shovels, and are welcome to recruit whatever whiskey-soaked ne'er-do-wells they can find at the camp saloon. Sorry, California 1850s (or Yukon 1890s, actually might be better). Absent minded typing. I'm yet another person whose group never used hirelings in our OD&D/AD&D games. We were definitely "pre-movie era", so I agree that it had to do with the way the rules were written (i.e., they seemed like an afterthought), complication, and pre-conceived images of what an adventure should be like. From my reading, at various stages in the life of the game, it seems to me there were four different classes of "followers". The first two were pure employees and included "normal" or "zero-level" porters, mule-drivers, and the like, as well as mercenary adventurers. The third was the "henchman", modeled I suppose after Moonglum. And the fourth was the true "follower" gained after reaching a high level. We were definitely "pre-movie era", so I agree that it had to do with the way the rules were written (i.e., they seemed like an afterthought), complication, and pre-conceived images of what an adventure should be like. It's interesting how many people say this, because, for me, it seemed very clear that the primary purpose of the Charisma ability was in attracting and maintaining the loyalty of hirelings and henchmen. That never seemed like an afterthought to me, but perhaps I was just unusual in thinking this way. Dogs, wardogs actually, really make the difference for me. Me and my group where never really keen on henchmen or hirelings but we LOVED packs of wardogs. We also spent lots of hard earned gps on wonderfull marble tombs for them. A friend in my brother's campaign had five named: Zappo, Zrppo, Zippo, Zoppo, Zuppo. Yes, we used to have lots of war dogs too. In one campaign, a halfling thief was particularly fond of spending his hard-earned loot on them and acquired a large enough collection of them that, when things got tough, his companions would urge him, "Release the Pack!" This could be a great tool for introducing a new player to a game, especially one new to gaming in general. Make them a hireling/henchman of the group. This gives them an instant role in the adventure (even if in a less heroic capacity), obligates the rest of the party to defend them (in theory, at least), and doesn't overwhelm the new player. I have never been fond of inserting a new character--certainly not a player new to gaming--into the game with free levels to match the extant pc's. Even if you do this, a new player can still be the zero-level scroll caddy for a session or two, until he or she is comfortable enough to want to make their own character. Or upgrade them into a full pc-type, whichever the player wants to do.